So, I was caught off guard on this one. Every now and then I'll have a warning about a little one at school or playschool having Chickenpox. And I've heard that this is a great thing- I want my children to have Chickenpox. It seems. I think this is about getting it out of the way with. I have heard rumours of parents hosting 'Pox Parties'. At the weekend, Tiny had a nasty spot on his eyebrow. We were away and my mum 'brought it to my attention'. I was more worried about his nasty cough and slight fever. On Monday morning the boys had a lie in. Not like them, I woke them at nine as we needed to make the most of our morning before travelling home. Tiny had a couple more spots on his face. On the way home I checked out NHS Direct. Tiny had lost his appetite for most of the weekend, it's not unlike him, so whilst I was aware I wasn't overly concerned as he was drinking plenty. He had a fever but he was fine in himself. We were away at Butlin's and he had been loving every minute. And on Sunday night when he fell asleep over dinner we put it down to him being worn out from the holiday. 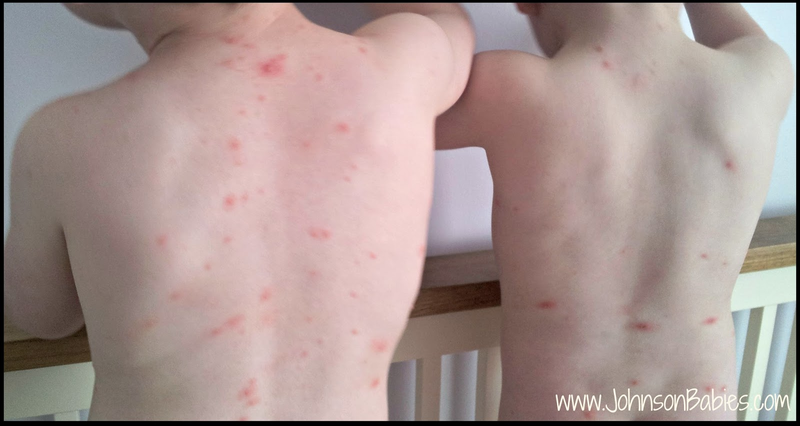 When the boys went to bed on Monday night I was 99% certain Tiny had Chickenpox. Cheeky had one tiny spot, which I suspected would become chickenpox. Tuesday morning, Tiny was covered and Cheeky had clusters of pox. I took them both to the doctors, where both were confirmed with Chickenpox, Tiny- severe, Cheeky- mild. And additionally Tiny has a chest infection which may or may not be linked to the chickenpox so is on a course of antibiotics. The thing that I didn't know about chickenpox which I do now is that the symptoms are most similar to flu. And as we treat the boys with this in mind life has become much easier. They are frustrated being ill, they have spurts of energy, and are back to afternoon naps- and they volunteer at the bottom of the stairs for naps rather than us trying to coax them. Whilst Cheeky has lots of spots, they are small and clustered. Tiny has blistering spots, all over, and they look painful. I didn't realise chickenpox looked so much like regular spots, and at its mildest it does. Chickenpox has once again demonstrated how different the boys are. As always, Tiny has been more susceptible. Cheeky had no symptoms in the lead up to the spots emerging. Tiny had a fever, loss of appetite, and was lethargic. Tiny is clingy in the day. Cheeky is clingy at night. And both of them live in the same home. In contact with the same people. It reinforces that they are two different people, who were born on the same day. aw poor boys, at least they will have it now and then never again. My little man had it when he was around 6 months and was really really ill, the sores became infected and they had to give him strong antihistamine and antibiotics as he was in so much pain even holding him and he couldn't lie down as it was all over his back, so I think your boys are a great age - not to old for it to be to awful and not so young that they are not strong enough to fight it. Hope they start to feel better really soon.